The Midnight Palace is the second in a series of novels I wrote for young adults in the 1990s, back when even I was probably more young than adult myself! Writing for the young, or the young at heart, is a risky business and I learned that teenagers are a notoriously demanding and honest audience. My intention when crafting these books was to create stories that would appeal to them; also that they would hopefully be enjoyed by more mature and experienced fellow travellers for whom they might rekindle memories of the first books they had read, those magical tales of mystery and adventure that every reader hoards in the treasure chest of their brain. So whether you are young or young at heart, I hope you will enjoy this ride into the twilight world of Calcutta in the 1930s, where the shadows of the night are thicker than blood. Never mind the number of candles on your birthday cake – for those in the know, it’s what lies beneath them that matters! Pre-order your copy at Waterstone’s now and be in with a chance of buying a signed edition. The first 1000 copies ordered at waterstone’s.com will be signed by Carlos Ruiz Zafón and are unavailable to buy anywhere else. Pre-order here. QUESTION: In which city is The Midnight Palace set? Do you know someone who might like books by Carlos Ruiz Zafón? Why not tell them about him by sending them this newsletter. 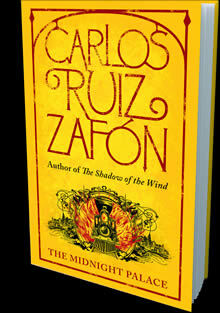 The first 500 people to send this on to a friend will be sent a limited edition leather Carlos Ruiz Zafón bookmark.